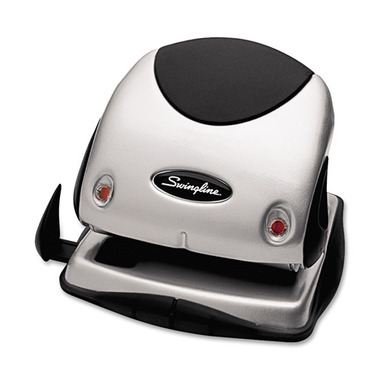 Two-hole punch offers a unique punch positioning system that lets you know when the paper is correctly aligned for perfectly placed holes every time. Convenient chip disposal prevents messy spills. Soft grip handle locks down for easy storage. Two-hole punch drills through up to 20 sheets of 20 lb paper at a time. Includes personalized name plate so your punch never "walks away".